And he couldn’t have been more correct. Winter is that unique time of the year when everything is either dead, dying, or frozen and you have to work extra hard for the things you’d usually have handy during the milder seasons. Winter may be the time to hibernate for most animals, but for us humans, it’s the time to hustle— hard— if we want to get things done. When SHTF in the dead of winter or if you find yourself lost in the wilderness, will you be able to survive? Here are a few things to remember to get you through this frigid season. Clothing is your first level of protection in this harsh weather, so make sure you’ve got proper layers on. Your base layer should be made of wicking fabric to keep sweat and moisture off of your skin. Merino wool is an exceptional kind of fabric that keeps you warm and dry when it’s cold and keeps you cool when it’s hot out. Synthetic fabrics like polyester do well as a base layer, too. Stay away from cotton as it absorbs a lot of moisture. It will stay soaked when it gets wet and that could lead to hypothermia. Animal hide and seal skin have been used by people who live in arctic climates to fend off the cold, so take it from them to keep warm if you’re in the same terrain. Prevent heat from escaping your head by wearing hats and scarves. You gotta keep in mind that not all tents are suitable for the winter, so pick a one that can withstand the biting cold. Many cold-weather shelters and specialty tents are large enough to accommodate you and your gear and have ample space for wood-burning stoves to keep you warm. Basic seasonal tents are usually made from nylon, while cold-weather tents are usually made of silicone and polyurethane to keep cold and moisture out. However, these types don’t accommodate wood-burning stoves very well. They can be bulky and heavy as well, so take the fabric’s weight and durability into account when you’re choosing a tent. You also have to make sure that the tent has enough ventilation. Another great addition to your winter tent is a space blanket. Also known as an emergency or mylar blanket, this item helps reflect heat back to the body. It’s also lightweight and widely available, so you can bring one or two in your backpack. Tarps also do a good job of keeping rain out of your camp. On the off chance that you find yourself without a tent, space blanket or tarp, there are various emergency shelters that you can build using natural materials like poles, branches, foliage, and some cordage. One of the most common types of shelter is the wikiup. Here’s a neat video of how to make one. Picking the right location is crucial to building your fire. Choose one with natural protection against the wind; a large rock, boulder or log would do. These natural windbreakers can also act as heat reflectors. Dig beneath the snow and keep the area clear from it. Don’t build your fire beneath trees— their branches are laden with snow that can melt and put your fire out. Using the right firelay can keep your fire burning for a longer period of time. Ideal firelays for winter are the log cabin and upside-down firelays as they can burn for a long time with minimum supervision. You can also try to build a long fire or this self-feeding fire that can burn for 14+ hours. Trying to find dry tinder in the winter can be a challenge as everything will be damp from the snow. Your knife will be your best friend; you can use it to whittle down dead branches until you get rid of the damp bark and find dry wood. Pine and birch bark also works nicely. Why stick to one when you can have a bunch? It’s always great to have an array of firestarters within your reach— when one doesn’t work, you’d still have other options to light your fire with. If you’ve suffered from a wreck, you can use the oil to start a fire. Char cloth is also a handy firestarter that you can keep in an Altoids tin. You can also pack some DIY egg carton firestarters in a waterproof ziplock baggie. Make sure you’ve got more than one way to light that fire, too. Your matches can easily get wet and soggy, so don’t forget to pack a ferro rod, firesteel and a couple of trusty Bic lighters in your kit as well. Just because it’s cold out, doesn’t mean you don’t have to replenish lost liquids. It’s also a way to protect yourself from hypothermia and possible frostbite. Fortunately, finding water during the winter is not a problem as long as you have means to melt it. Under no circumstances are you to ingest snow. Again, do NOT eat snow. Doing so would decrease your core temperature and will bring all sorts of trouble, starting with hypothermia. What you want to do is pack that snow really tight into a container to get rid of any excess air before putting it over the fire to melt. The heat also kills microorganisms and other nasties from your drinking water. It’s important to keep your energies up during the winter. Your body is working twice as hard to keep you warm, so it’s going to need all the fuel it can get. Hypoglycemia (low blood sugar) is a real threat during these cold times and it can often lead to confusion, headaches, and dizziness. Drinking plenty of water will help reduce the hypoglycemic effect. Foods like apples, molasses, licorice roots and wild yam are also particularly effective in combating hypoglycemia. Other foods that can tolerate winter temperatures include wild nuts like acorns, berries, plums, cattails, and mushrooms. Here’s a detailed article on how to forage for these wild edibles. Trapping is an efficient way to find some meat. Rigging multiple traps and snares saves you a lot of time and energy compared to hunting. Rabbits and squirrels are available even during the winter. Their meat is pretty lean and won’t lend a lot of fat, but it should be able to sustain you in a survival situation. Other meatier game includes beavers, raccoons, and deer but you’ll have to actively hunt for these. Navigating in the winter, when trails can be obscured by snow and daylight is painfully short, is no easy feat. The combination of thick snow, biting wind and poor visibility can pose a challenge, even when you’re familiar with the terrain. A map or even a GPS device will be of great help in finding your way back to safety. Avoid avalanche-prone areas like steep inclines and areas with scarce trees. If you can’t find a trail, try to look for other signs and watch out for landmarks. Heavy flurries and blizzards can lead to whiteout conditions. It’s always safer to stay put during these situations, but if you need to move, here’s how to do so safely. Sat phones will come in handy when you’re trying to reach for help. Fire, smoke and mirror distress signals can be helpful, too. Anything dark or that goes in contrast with the white backdrop (like branches forming an SOS over the snow) can serve as a signal for help. Winter is never an easy time, survival situation or not. Like Sinclair Lewis said (by the way, in addition to being a novelist, he is also a Nobel Prize laureate), it’s really more of an occupation than a season. You gotta put your back into it if you don’t want to freeze to death. 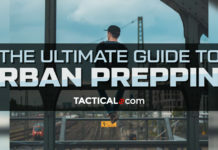 For preppers, it’s actually a good time to practice your survival skills. The average budding survivalist will just camp out and practice their skills during the summer when conditions are nice and fair. If you really wish to test your fire making skills or want to see if you can build a quinzhee, the winter is the perfect time to push your limits and see if you can survive and even enjoy your time outdoors while you’re at it. Popular survival enthusiasts like Survival Lilly and Joe Robinet routinely camp out in the winter— and sometimes even in deep snow— just to test their skills. It’s a unique time of the year and a great opportunity to learn new things. Got more winter survival skills that we missed? Let us know in the comments below!